In March 2012, the ruling party of the Republic of South Africa, the Africa National Congress (ANC) expelled the President of its youth wing, Julius Malema. The zealous Malema was accused by senior figures of the ANC of showing no remorse for “sowing divisions” within its ranks. Political analysts and commentators were quick to declare his political career, which was on an augmentation trajectory, as dead. Dirk Kotze, a political scientist at the University of South Africa in Pretoria, for instance, categorically stated that Malema without the ANC was nothing since he depended greatly on the tradition and the history of the ANC. He suggested that Malema needed the ANC in order to be able to make his point and anything to the contrary left him isolated. However, in 2013 the belligerent Julius Malema launched the Economic Freedom Fighters (EFF). In keeping true to his abrasive and hubristic nature, he declared that the EFF is like a baby that is born an immediately begins to walk. The otherwise ambitious declaration would gain relevance during the 2014 general elections. The elections heralded the rise of the EFF as the 3rd largest party in South Africa after it received an impressive 1,169,259 votes, which represented a 6.35% share of the vote. The setting and structure of the EFF attests to its success. The Party, from the onset, draws it inspiration from the Marxist–Leninist tradition. The merits of this tradition aside, it should be noteworthy that no Kenyan Party, be it in the opposition or the ruling party, subscribes to any ideology. It is on the premise of this ideology that the EFF has been in a position to craft their policies with utmost ease, clarity and precision. The EFF has meticulously crafted a range of policies, including that they intend to push for the actualisation of those policies in the event they ascend to power. The party demarcates as their zones of concern the areas touching on land, nationalisation, building state capacity, education, health and sanitation, industrial development, growth of the African economy, and the need for accountability in government. The party deconstructs these areas very articulately by enumerating how the set out objectives can be obtained within the economic, social and legal confines. The performance of the EFF in Parliament has also been exceptional. The party has 25 Members of Parliament. The contemporaries of the EFF in Kenya have consistently attributed their lacklustre performance in parliament to the inability to cope with the tyranny of numbers. But this notion has never bothered or frustrated the EFF’s quest for an effective democracy. The EFF is not a ball boy like many African opposition parties — it is not a pushover party. The Democratic Alliance (DA) has been in parliament for long compared to the energetic EFF but has never realised the zenith that the EFF has over a period of three or so years. Comparatively, no opposition party has ever rightly frustrated a sitting corrupt president like the EFF has. The party not only cleans the South Africa’s politics and governance but also sets an example to the youth and politicians in the so-called Third World. This party is a reincarnation of the great leader, the man Thomas Sankara. Sankara, popularly branded as Africa’s Che Guevara, has had a huge impact on the EFF establishment. Sankara personified the pursuance of ambitious programmes for social and economic change, and this has been emulated perfectly by the EFF if their call for free education to all is anything to go by. The influence of Sankara on the EFF extends beyond policy issues. The dressing and mannerism of the EFF is an embodiment of the upright man. The said dressing, coupled by the youthful touch that is characterised by songs and dances during public rallies, has endeared the EFF to most. Its approach has ensured an upsurge of crowds attending its rallies, which are usually carried out in a manner that asserts political maturity. 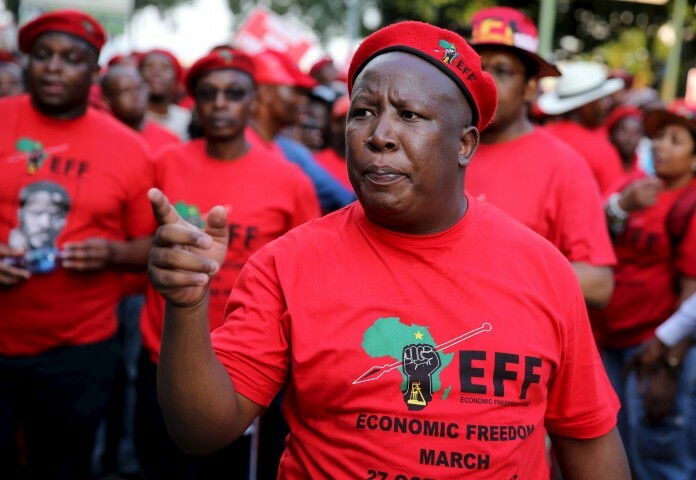 The leaders of the EFF limit their speeches to core issues affecting the State as was evident recently during the release of the State Capture report. This is in sharp contrast with the Kenyan Opposition, which is always inclined to engage in insults, character assassination and at times sordid hate speech. The EFF has not shrunk the implementation of their vision to the structures established by Parliament alone. In circumstances where Parliament has failed to be bipartisan and hold the government to account, the EFF has passionately pursued the same through the Courts. In another attestation of political maturity, the EFF and the DA have in some cases opted to have a common front when confronting the ills of the ANC government. This unrelenting industry and vision of the EFF has resulted in judgements of monumental significance. In Economic Freedom Fighters vs. Speaker of the National Assembly and Others and Democratic Alliance vs. Speaker of the National Assembly and Others  ZACC 11, the Constitutional Court of South Africa found the President to be in breach of the Constitution. The EFF has been in the forefront in pushing for the implementation of the judgment, which had been for an unreasonable period remained latent. Through ingenuity and exuberant impetus, the EFF constantly disrupted House proceedings and advocated for the implementation of the judgment at every available forum. Their efforts bore fruit after President Zuma eventually began paying back the money he had unconstitutionally used on his private residence, as was ordered by the Court. The Kenyan Opposition leaders have become press conference addicts in their pursuit to address unconstitutional acts done by the Executive while disregarding the Judiciary channel. It is trite knowledge that the Judiciary in South Africa has distinguished itself as it enjoys impeccable integrity; public confidence in the institution is robust. However, this is not reason enough not to pursue judicial redress whenever circumstances call for that. The Judiciary in Kenya has developed some modicum of independence that should be exploited fully by the Opposition. Of course, the EFF is also riddled with its fair share of shortcomings. Their zeal and enthusiasm occasionally results in unnecessary interferences with parliamentary proceedure with the sole aim of frustrating House operations. Further, the EFF belief that socio-economic rights are the key to economic emancipation often blinds them to consider the economic realities that would hinder implementation. However, these defects notwithstanding, opposition parties around the African continent should endeavour to emulate this South African party that has set the bar in how opposition parties ought to approach governance. The method adopted by the EFF party allows for efficient checks and balances and nurtures an ingenious approach to deal with stubborn governments that have a penchant for engaging in unconstitutional acts.